New York, New York – it's a wonderful town. Apparently. One of its pleasures are its diners, open all hours and serving all sorts of things, a New York diner is its own kind of restaurant. Definitely something worth experiencing. But if you think this Note is heading across the pond you're mistaken, 'cause there's a fairly acceptable (by New York standards), New York diner here in London. It's called Automat, and it's on Dover Street, behind Green Park station-ish. Automat has all the things you'd know a good diner by: Venetian blinds, a white tiled floor, leather clad booths that you can slide into but need to un-stick yourself out of, dark wood tables and chairs, Heinz 57 ketchup on the tables, specials that vary daily and American sized portions. It's placed at the classier end of the diner scale of course, it may be NY style, but this IS Mayfair. If you're booking, and it's a good idea to book, be aware that the front section is a bit too London caff, the middle section is long and narrow – supposed to be something like an old train carriage, and the back section gets all the light from the big windows at the back, but is also quite noisy when it gets going. 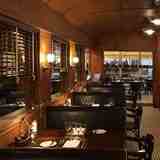 There aren't that many places in London where you can still sit down to a meal at midnight, but at Automat you can. The dinner menu is served until 12, so you've the chance to sate your need for a midnight feast on a burger - or veggie or chicken varietal, one of several cuts of steak, a rack of lamb, or a bit of sole, halibut or cod. At the other end of the day they'll serve you proper buttermilk pancakes, waffles, something called bourbon French toast, Eggs Benedict, Norwegian or Florentine, or steak, eggs and chips etc. And of course they do a particularly grand brunch, as all NY diners should, featuring a combination of all of the above – the dinner and breakfast menus. This is American comfort food from mac and cheese to apple pie. The prices are probably a bit NY for a lot of people, but it's usually busy, so either there must still be plenty of Londoners who'd like a little bite of apple with their meal. Cost: £13 for an Automat burger - which is plenty of food!